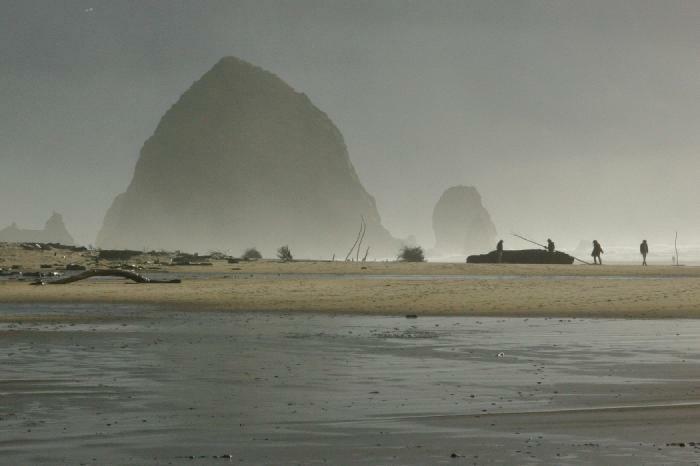 Cannon Beach is a small community on the Oregon Pacific coast, south of the Columbia River estuary. The large rock in the background of this photo is called Haystack Rock. There are actually better places to photograph Haystack Rock when driving further south on some of the roads within the city. What I like about this picture and this vantage point is the atmosphere captured on this very windy and cold day at the end of January, with the rock almost hidden by the fog and the people on the right on the beach. The equipment used for this picture was my first digital camera, the Canon EOS 300D (Digital Rebel), using the kit lens of my old film EOS 300, the Canon EF 28-90 ƒ/4-5.6. The photo was taken on January 28, 2006 using a shutter speed of 1/1000 second, an aperture of ƒ/18, 800 ISO and a focal length of 90 mm. I took this picture before I really knew how most of the camera settings worked and even though the aperture of ƒ/18 is great for the depth-of-field in this shot, using 800 ISO with what is Canon's first entry-level digital SLRs resulted in a very grainy, or as it is called in digital photography, noisy picture. More pictures of this trip around the Oregon coastline are available in a photo album. Unfortunately, as it came out of the camera, this picture had a lot of debris on the left side of the picture, so this version of it is cropped down quite a bit. The original picture can be found in the photo album as well.